Ubiquitous. Present, appearing or found everywhere. Synergy. The interaction or cooperation of two or more organizations, substances or other agents to produce a combined effort greater than the sum of their separate effects. Seeker. A person who is attempting to find or obtain something. Ubiquitous Synergy Seeker (USS) is a Canadian alternative rock musical duo – namely a musical duo that is sonically out there. They got their start performing in Toronto, Ontario and the band includes the talents of vocalist, guitarist, and ehru player Ashley Buchholz (aka Ash Boo-Schultz) backed by turntable and hype man Jason “Human Kebab” Parsons. Fun fact, as DJ Human Kebab, Parsons hosts not one but two alternative rock radio remix shows in his spare time. The first one began four years ago in 2013 on Edmonton, Alberta station SONiC 102.9 with the show SubSONiC. Last year Human Kebab got another gig with Rock Paper Mixers on KX 93.5 in Laguna Beach, California. 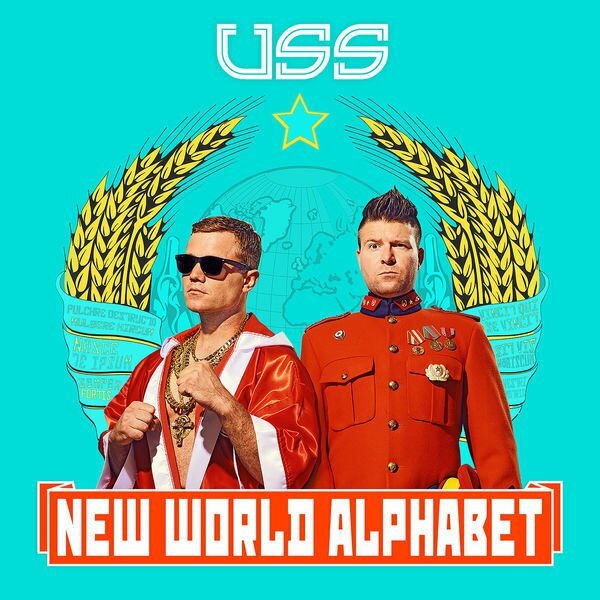 As already mentioned, the USS sound is an eclectic mix of guitar, beats that include drum AND bass, and 2-step rhythms that bleeds into electro-pop. Filled to the brim with energy, and all kinds of enthusiasm for musical hard work, New World Alphabet is the sophmore album that follows 2009’s Questamation. That’s right, their second full-length effort comes eight years later. Yes, there were some EP’s inbetween, but nothing quite beats a record you play over and over again for at least an hour. Though admittedly this one doesn’t quite meet that mark – It’s barely half an hour long, after all. But maybe that isn’t a bad thing. Their music is after all infectious, and the first single, Work Shoes starts the eight track album on a high note. I saw them live in the summer of 2013 and this energy transfers well whether in studio or playing to an outdoor arena. Work shoes fits like, well, like a well worn shoe. Followed up by the track Who’s With Me, USS keep the energy going and maintain the positive vibes which we’ve come to to love, warning us not to paint their rainbow grey. Domino shows the other side of the band, that quizzical and abstract thinking that I’ve come to love. California Medication makes waaaaay more sense now that I know Human Kebab DJs for a Laguna Beach radio station, but it’s effectively a call to action to escape our harsh Canadian winters and have fun somewhere in the sun. Sounds just peachy to me. Alien is probably my LEAST favourite track of the moment, but I’m willing to bet it’ll grow on my over time if I let it. It’s probably the striped down production of the track that’s throwing me off, but I wish there was more oomph behind it. Track no. 6 gets us right back on track with Us. Say that three times fast. But don’t let that fool you because this is a slow jam, featuring some peanuts. Broken Smile and Vulcan close out the album, and they shouldn’t be missed. Broken Smile is probably my favourite song, but I won’t say anything else about it. Vulcan is haunting too. Other reviewers will try to convince you that this is the fifth album by USS, but don’t be followed creative cuties, and accept no substitutes. This is Ash Boo-Schultz and Human Kebab at full strengh, set phasers to stun. Ubiquitous Synergy Seeker remain clever and relevant. They are the perfect blend of Canadian witticisms and energy. They deserve all the success in the world, and I hope they obtain whatever they are looking for by combining their efforts and being everywhere all at once. That’s just my theory anyway.